Not all lawful permanent residents choose to pursue U.S. citizenship. Those who wish to do so may apply after meeting certain requirements, including having lived in the U.S. for five years. In fiscal year 2017, 986,851 immigrants applied for naturalization. The number of naturalization applications has climbed in recent years, though the annual totals remain below the 1.4 million applications filed in 2007. 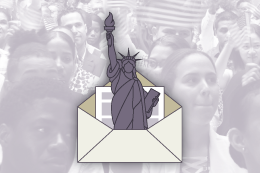 Generally, most immigrants eligible for naturalization apply to become citizens. 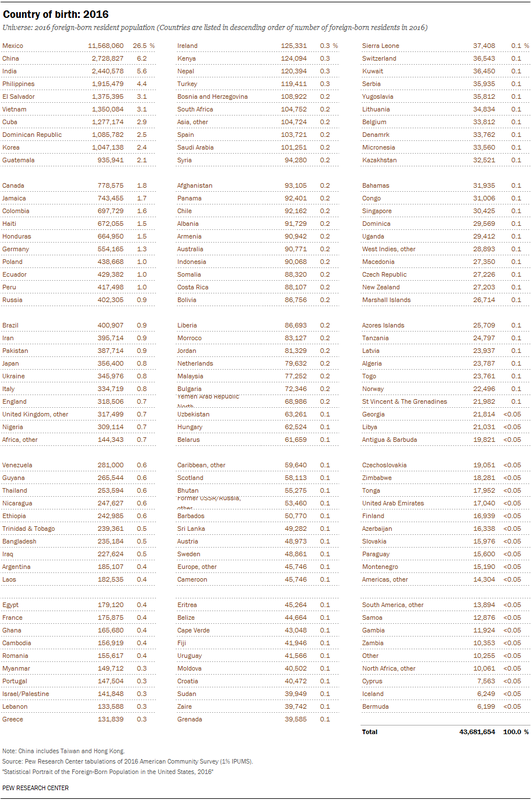 However, Mexican lawful immigrants have the lowest naturalization rate overall. Language and personal barriers, lack of interest and financial barriers are among the top reasons for choosing not to naturalize cited by Mexican-born green card holders, according to a 2015 Pew Research Center survey. Mexico is the top origin country of the U.S. immigrant population. In 2016, 11.6 million immigrants living in the U.S. were from there, accounting for 26% of all U.S. immigrants. The next largest origin groups were those from China (6%), India (6%), the Philippines (4%) and El Salvador (3%). By region of birth, immigrants from South and East Asia combined accounted for 27% of all immigrants, a share equal to that of Mexico. Other regions make up smaller shares: Europe/Canada (13%), the Caribbean (10%), Central America (8%), South America (7%), the Middle East (4%) and sub-Saharan Africa (4%). By race and ethnicity, more Asian immigrants than Hispanic immigrants have arrived in the U.S. each year since 2010. Immigration from Latin America slowed following the Great Recession, particularly from Mexico, which has seen net decreases in U.S. immigration over the past few years. Asians are projected to become the largest immigrant group in the U.S. by 2055, surpassing Hispanics. 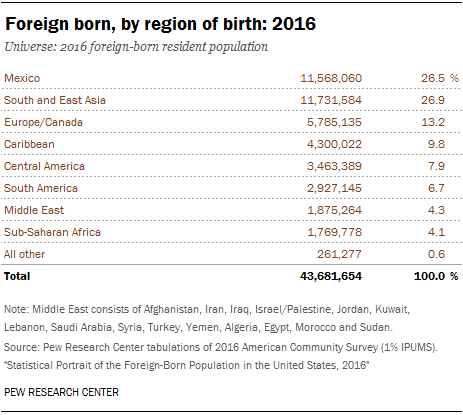 Pew Research Center estimates indicate that in 2065, Asians will make up some 38% of all immigrants; Hispanics, 31%; whites, 20%; and blacks, 9%. Looking forward, immigrants and their descendants are projected to account for 88% U.S. population growth through 2065, assuming current immigration trends continue. In addition to new arrivals, U.S. births to immigrant parents will be important to future U.S. growth. 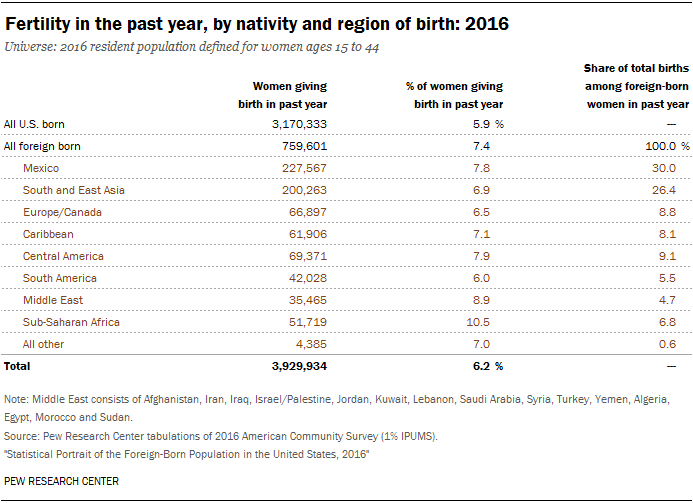 In 2016, the percentage of women giving birth in the past year was higher among immigrants (7.4%) than among the U.S. born (5.9%). While U.S.-born women gave birth to over 3 million children that year, immigrant women gave birth to more than 750,000. In fiscal 2017, a total of 53,716 refugees were resettled in the U.S. The largest origin group of refugees was the Democratic Republic of the Congo, followed by Iraq, Syria, Somalia, and Burma (Myanmar). Among all refugees admitted in that fiscal year, 22,861 are Muslims (43%) and 25,194 are Christians (47%). California, Texas and New York resettled nearly a quarter of all refugees admitted in fiscal 2016. Roughly half (46%) of the nation’s 43.7 million immigrants live in just three states: California (24%), Texas (11%) and New York (10%). California had the largest immigrant population of any state in 2016, at 10.7 million. Texas and New York had more than 4.5 million immigrants each. 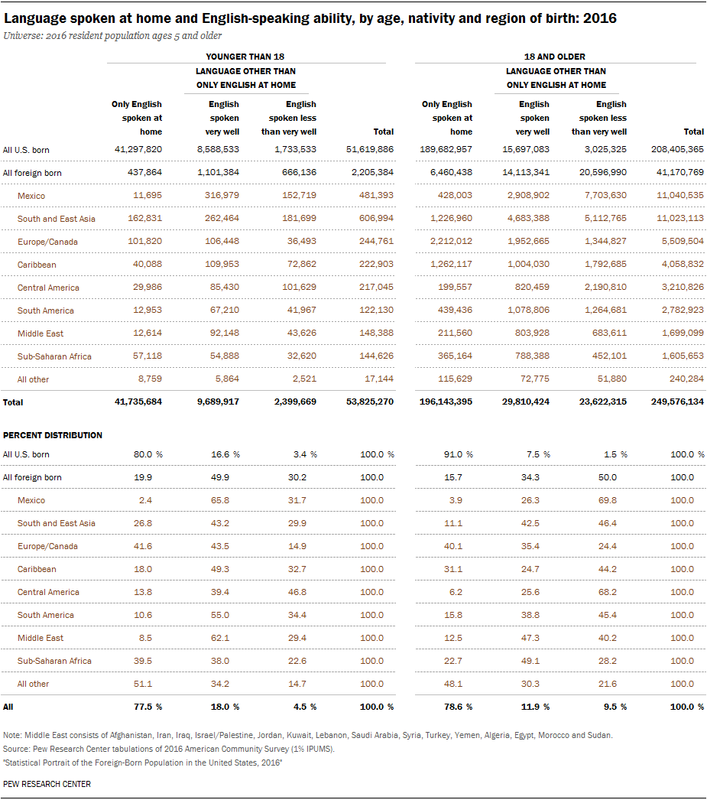 In terms of regions, about two-thirds of immigrants lived in the West (34%) and South (33%). Roughly one-fifth lived in the Northeast (21%) and 11% were in the Midwest. 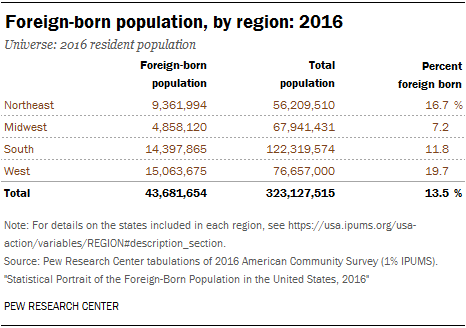 In 2016, most immigrants lived in just 20 major metropolitan areas, with the largest populations in New York, Los Angeles and Miami. These top 20 metro areas were home to 28.3 million immigrants, or 65% of the nation’s total. Most of the nation’s unauthorized immigrant population lived in these top metro areas as well. Immigrants in the U.S. as a whole have lower levels of education than the U.S.-born population. In 2016, immigrants were three times as likely as the U.S. born to have not completed high school (29% vs. 9%). However, immigrants were just as likely as the U.S. born to have a college degree or more, 32% and 30% respectively. Among all immigrants, those from South and East Asia (52%) and the Middle East (47%) were the most likely to have a bachelor’s degree or more. Immigrants from Mexico (6%) and Central America (9%) were the least likely to have a bachelor’s or higher. In 2016, about 28 million immigrants were working or looking for work in the U.S., making up some 17% of the total civilian labor force. Lawful immigrants made up the majority of the immigrant workforce, at 20.6 million. An additional 7.8 million immigrant workers are unauthorized immigrants, the first time since 2006 that the number was significantly below 8 million. They alone account for 4.8% of the civilian labor force, a dip from their peak of 5.4% in 2007. During the same period, the overall U.S. workforce grew, as did the number of U.S.-born workers and lawful immigrant workers. Immigrants, regardless of legal status, work in a variety of jobs and do not make up the majority of workers in any U.S. industry. Lawful immigrants are most likely work in professional, management, or business and finance jobs (38%) or service jobs (21%). Unauthorized immigrants, by contrast, are most likely to be working in service (31%) or construction jobs (17%). Immigrants from Mexico have the lowest rates of English proficiency (32%), followed by Central Americans (33%) and immigrants from South and East Asia (54%). Those from Europe or Canada (76%), sub-Saharan Africa (72%), and the Middle East (61%) have the highest rates of English proficiency. 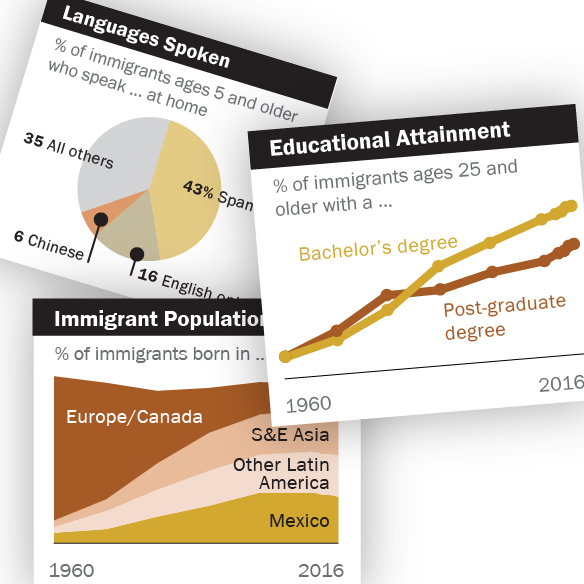 The longer immigrants have lived in the U.S., the greater the likelihood they are English proficient. Some 44% of immigrants living in the U.S. five years or less are proficient. By contrast, more than half (55%) of immigrants who have lived in the U.S. for 20 years or more are proficient English speakers. Among immigrants ages 5 and older, Spanish is the most commonly spoken language. Some 43% of immigrants in the U.S. speak Spanish at home. The top five languages spoken at home among immigrants outside of Spanish are English only (16%), followed by Chinese (6%), Hindi (5%), Filipino/Tagalog (4%) and French (3%). Around 340,000 immigrants were deported from the U.S. in fiscal 2016, slightly up since 2015. Overall, the Obama administration deported about 3 million immigrants between 2009 and 2016, a significantly higher number than the 2 million immigrants deported by the Bush administration between 2001 and 2008. Immigrants convicted of a crime made up the minority of deportations in 2016, the most recent year for which statistics by criminal status are available. Of the 340,000 immigrants deported in 2016, some 40% had criminal convictions and 60% were not convicted of a crime. From 2001 to 2016, a majority (60%) of immigrants deported have not been convicted of a crime. The number of apprehensions at the U.S.-Mexico border has sharply decreased over the past decade or so, from more than 1 million in fiscal 2006 to 303,916 in fiscal 2017. Today, there are more apprehensions of non-Mexicans than Mexicans at the border. In fiscal 2017, apprehensions of Central Americans at the border exceeded those of Mexicans for the third time since 2014. While immigration has been at the forefront of a national political debate, the U.S. public holds a range of views about immigrants living in the country. Overall, a majority of Americans have positive views about immigrants. Six-in-ten Americans (65%) say immigrants strengthen the country “because of their hard work and talents,” while just over a quarter (26%) say immigrants burden the country by taking jobs, housing and health care. Yet these views vary starkly by political affiliation. Among Democrats and Democratic-leaning independents, 84% think immigrants strengthen the country with their hard work and talents, and just 12% say they are a burden. Among Republicans and Republican-leaning independents, roughly as many (44%) say immigrants are a burden as say immigrants strengthen the country because of their hard work and talents (42%). Note: This is an update of a post originally published May 3, 2017.